I embarked on a juice cleanse last week. I haven't been obnoxious enough when talking about what I eat for awhile now, thus the need to up my game. Also, I've been trying hard to find the reset button lately. My energy has been down. I've been feeling sluggish and just, sort of blah. It's not that I have terrible habits. I mean, I know how to eat healthy, I like eating healthy, but hummus. And mac and cheese. Mostly mac and cheese, because do you know how hard it is to find good dairy-free mac and cheese? When you find that, you don't let it go. Except I kind of have to. I know I could just add more veggies to my meals, but I thought starting with a clean slate might be the jump start I need to make more positive changes. I briefly considered picking up a book on cleansing and making my own juice, but it's a solid twenty minutes of work just to make orange juice for my children; the thought of prepping, juicing, and cleaning my juicer six times a day for multiple days is a bit more than I can handle right now. After some research, I chose a juicery in my area and decided to go with their signature three day cleanse. One day seemed like far too little to make a difference, and five days seemed like way too long. I have will power, but, well, I know myself. I took notes throughout the process- for posterity's sake, probably, but I'll share them here, too. It's recommended to prep at least 48 hours prior to starting a cleanse, eliminating foods like sugar, alcohol, gluten, sometimes all grains, dairy, and meat to make the actual cleanse easier and more effective. I had a moment of silence for the chocolate I would not be consuming and pressed on. The juice was delivered to my house the night before; eighteen bottles to be split between three days, and consumed 2-3 hours apart. I loaded them into my refrigerator and made myself a big bowl of comfort soup. Emotional eating- there are so many reasons I need to do this. - I brought my first juice to the breakfast table, where my family sat with their oatmeal. I looked over the ingredients: dandelion, parsley. Those have never made it into any juice that I've made, but I'm no stranger to odd combinations, so I took my first sip and not a drop more. I now knew exactly why I'd never drank dandelion before. Luckily, my family started cheering me on: "Mom! Mom" and "Drink! Drink!" Just another reason I feel like I live in a frat house. - It's raining and my initial thought is how much I want a bowl of soup. I don't eat one, obviously, but, hello, eating for comfort. - I'm unsure if my headache is from the cleanse or rising with the sun. Probably the cleanse, because the water I'm downing is doing little to alleviate it. - Oh, beet juice. I love beets. Really, I do. It's just that there was this time while pregnant that I drank beet juice right before a wave of morning sickness hit and now I can't get the memory of throwing up the very juice I'm trying to finish out of my mind. Luckily, once again my children have rallied around me and are cheering me on. - This would be the first day I didn't try to have LB at least attempt to nap. She's been napping less than half the time now, so I think we're ready to move to quiet time. Except it's not at all quiet. The loud, loud, loud is doing a number on my perma-headache. Also, both girls are demanding food which feels a little like they're rubbing it in. - I've been wanting to grab crackers all afternoon. And chocolate. I'm realizing just how much I must snack out of boredom, and habit, and just because it's there. - It's 3:20 in the afternoon. I'm glad I'm not juicing my own. I would cry if I had keep up with all the prep and cleaning this would be. - My children are hitting toy animals on their table a la, "We want food!" I do, too, kids. I do, too. - Beet juice again for dinner. The last drink is almond milk with dates, cinnamon, and vanilla bean, and I am so looking forward to it. - Overall, the day was rough. I felt like I'd walked ten miles to have myself beaten up. My headache lasted the entire day, I felt weak, my joints ached, and I was incredibly irritable. Per the recommendations that came with the cleanse, I soaked in epsom salts before going to bed as early as possible. Which, when you're not up late snacking, is pretty early. - I woke up feeling incredibly light and not at all bloated. I read this is typical, though my headache still remains. - Dandelions are not food. They just aren't. - I have never in my life loved grapefruit. Today, it tasted incredible. Had I been functioning any higher, I might have found my battery charger for my camera. Alas, this. - I am dreaming of steamed cauliflower with lemon and wondering how weird it would be to eat that for breakfast when this is over. - I could really get used to my children cheering me on everything I eat or drink something. - I drove behind a delivery car for my favorite pizzeria on the way to preschool pickup. I took it personally and it felt incredibly cruel. - The beet juice was surprisingly good. Enjoyable, even. I'm looking forward to enjoying the rest of the juices the next day and a half. - It's 3:00. Eff this. - Dinner tastes like despair. - Almond milk, you are my saving grace. - Another epsom bath. Another early bedtime. - Today was not quite what I expected. The cleanse instructions had me thinking today would be much easier than yesterday, as the toxins are working their way out. I was still irritable and exhausted with a headache that knows no mercy. Also, all of the juice plus a gallon of water means I pee no less than twenty times a day. So awesome. - I can tell that I'm sleeping more soundly. My dreams are stranger and more intense than usual, which is saying a lot. - I hate dandelions. I really do. - I'm really trying to make myself look forward to eating solid food tomorrow, but I can't. I'm so over drinking juice, but I just can't imagine enjoying regular food. I'll just be sad. - At least I have my almond milk. Once I eased back into eating regular food, my headache went away and I started feeling as good as I had hoped to during the cleanse. I've stuck with straight vegetables and fruits so far. I plan on adding grains and legumes back in slowly. I realize just how much of my eating comes from comfort and boredom. I knew it beforehand, but this experience really drove it home. I've been consistently making better choices in the few days since, and plan to continue to work on it. I feel like my focus is sharper and I have an increased connection with my thoughts. I'm able to think more clearly and breathe deeper. My sense of well-being is improved. I don't feel at all bloated or heavy. My energy is up and I'm sleeping better. I lost six pounds, which wasn't the intent of this, but I'll take it. I wasn't someone who lost weight breastfeeding; despite my best efforts, my body held onto every ounce. Now that I'm no longer feeding another human and can focus on weight loss, I would be lying if I said this wasn't welcome. All things considered, this was the kick start that I needed to get back into healthy habits and develop new ones. So would I do this again knowing that I would grumble and hate it 70 percent of the time? 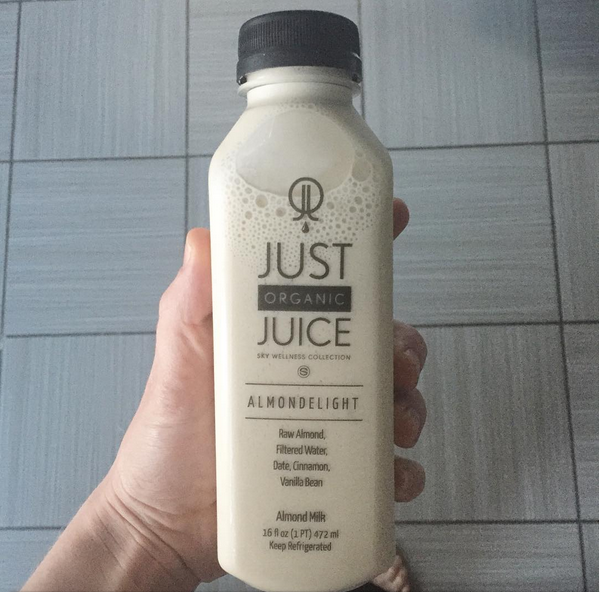 I mean, if only for the almond milk. 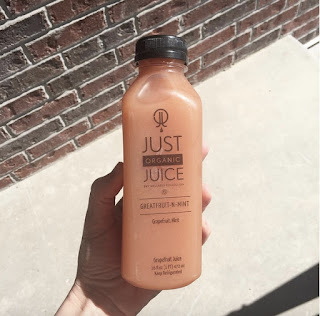 Locals, I used this amazing juicery. All calorie-deprived musings aside, I would recommend them to my dearest of friends. This isn't sponsored in any way. I'm just sharing the love. I'm not a doctor or health care professional. I'm opinionated, but my opinions are my own. If you're interested in trying a cleanse, do so based on your own thorough research. If you think cleanses are hokey, they probably are. If you think they might be helpful, they probably can be. Dandelions are weeds.